The UK uses a unique National Grid Reference System, although they are planning a conversion to standard UTM on which the National Grid is based. The National Grid system easily and simply specifies location to within 100 meters or better. It is the standard method of specifying location at varying levels of precision, and once you learn how it works you will see that it's very easy to use. Let's see how to navigate with the National Grid system! The entire country is divided into square grids 100 kilometers on a side. Each of these 100×100 km squares has a two-letter designator. For example, SU is a 100×100 kilometer grid in southern England, including the Salisbury Plain where you find Stonehenge, Avebury, and other megalithic sites. The datum origin is an arbitrary point in the Atlantic to the south-west of the tip of the Cornwall peninsula. It's the south-west corner of grid square SV. Everything is referenced to that origin point. The southwest corner of the SU grid is 400,000 meters east and 100,000 meters north of the datum origin. Each of these 100×100 km grids is subdivided into 1000×1000 meter grid squares. These appear as light blue lines on Ordnance Survey maps. 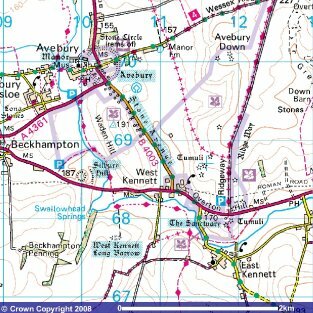 The small sample of 1:50,000 scale Ordnance Survey map seen here shows an area about 4 kilometers on a side. You see blue numbers on the grid lines, 09, 10, 11, 12, and almost 13 across the top, and then 70, 69, 68, 67 down just left of center. Those 1000 meter references are marked all around the perimeter of the map, and from time to time across its center. We can immediately see that the village of Avebury, toward the upper left of this map, is 10 kilometers east and 70 kilometers north of the south-west corner of grid SU. So, 10 is the easting and 70 is the northing, and Avebury village is at SU 10 70. That's rather vague, only accurate to a kilometer, but a village is a fairly large thing and easy to notice. Unless you were specifying the location of its main intersection or some other specific item, within a kilometer is probably close enough. A smaller object provides a better example. See the West Kennett Long Burrow, a burial mound of about 50 individuals from about 3,500 BC. It's toward the bottom, about a third of the way across the map above. It's in the 1 kilometer grid SU 10 67. Here is a small region of that 1:50,000 map, just a little more than the 1 kilometer square containing that feature. You could easily eyeball its location within its 1 km square as about 40% of the way across from the west edge and 70% of the way up from the south edge, so you could estimate its location as SU 104 677. But then you could estimate this more accurately with a millimeter scale on the map, or measure it in the field with GPS. 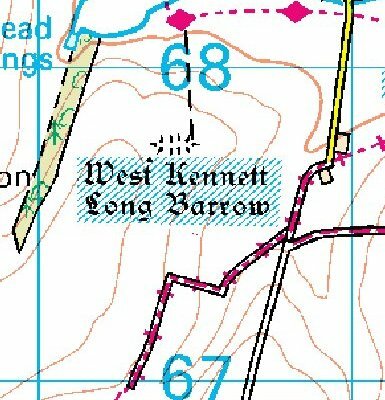 You can see the precision of the Ordnance Survey maps. The tomb really is a long barrow, it's about 105 meters long by 25 meters at its widest. Its shape and alignment show up even on the 1:50,000 map, the first map below. The 1:25,000 series, the second map, shows much more detail. Notice the increase in detail in the second 1:25,000 map. The barrow is now seen to taper toward the end away from its entrance. Fence lines and smaller buildings appear. Local high points and ancient and modern features also appear, see the "183" and the mound and reservoir to the southeast of the barrow. So let's specify the east end, where a footpath arrives at the entrance end of the mound. 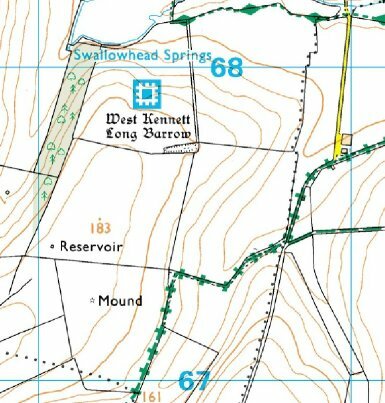 The footpath is shown as a dotted line in the 1:50,000 map. In the 1:25,000 map it's shown as a double line, as those lines are fences. A defined public footpath (dotted line with diamonds) passes nearby to the north, where another path branches off and accesses the site enclosed by a pair of parallel fences. We can now combine the grid square's location with the point's location within it to get an overly precise estimate of location. While the 1:25,000 maps might show some features with a precision of a few meters, consider things like road intersection: the roads themselves are a few meters wide, and so any position within 3 meters of the theoretical center of the intersection is going to be close enough. Plus, a handheld GPS unit is probably going to be no more precise than 5 or 6 meters. We could combine these measures to get a 1-meter position of SU 10492 67756 as shown below, or leave off some digits for a 10-meter position of SU 1049 6775, or even a 100-meter position of SU 105 678, still more than accurate enough to find a prominent object over a hundred meters long. You can directly calculate distances in this system by just subtracting the eastings and northings, as long as both points are in the same grid. You can easily measure to within 1 mm on the Ordnance Survey 1:25,000 maps, so that's 25 meter resolution read off the map. 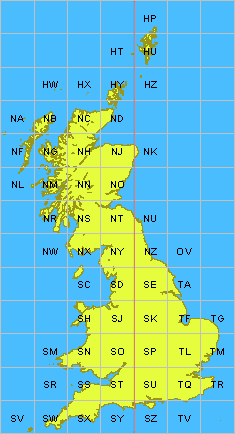 The standard UTM (Universal Transverse Mercator) grid system works similarly, with eastings and northings within a large grid, but with different details of reference datum and grid size and specification.